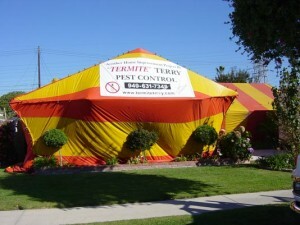 Termite Terry, your fumigation experts! Call 949-631-7348 today. “We had Termite Terry fumigate our house a couple of weeks ago. Skip came out and did the inspection and explained all his findings. After we scheduled the fumigation, he came back and patiently explained everything they were going to do, and answered all of our questions. He was very knowledgeable about the industry, including different types of chemicals that other companies use. “I want to thank Termite Terry and Skip for your help in coordinating the termite fumigation project with our re-roofing project of our six unit condos here in Costa Mesa. The tenting and fumigation went very smoothly. Skip was very helpful in educating our tenants as to what precautions are necessary on their part in protecting food items and opened medicine containers. We also appreciated the added measures you took to insure that the doors and windows were locked.